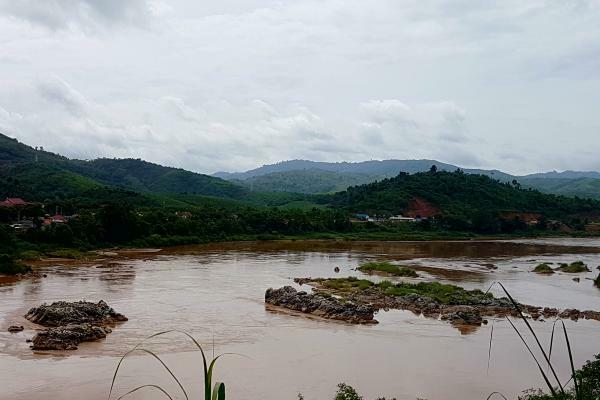 China plans to widen and deepen the Mekong near the Thai town of Chiang Khong to allow bigger Chinese cargo boats to carry their loads farther downstream to Luang Prabang in Laos. 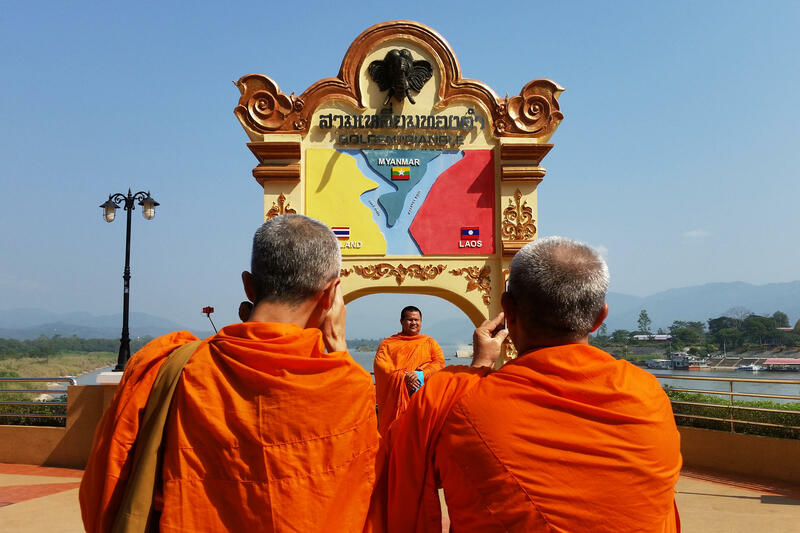 Buddhist monks snap photos on the Mekong in the town of Sob Ruak, northern Thailand, near the borders with Myanmar and Laos. Fisherman Singhkha Wantanam repairs his net in his shack on the Mekong near Sob Ruak, Thailand. He complains China's upstream dams have caused drastic changes in water levels and a reduction in the number of fish in the river. 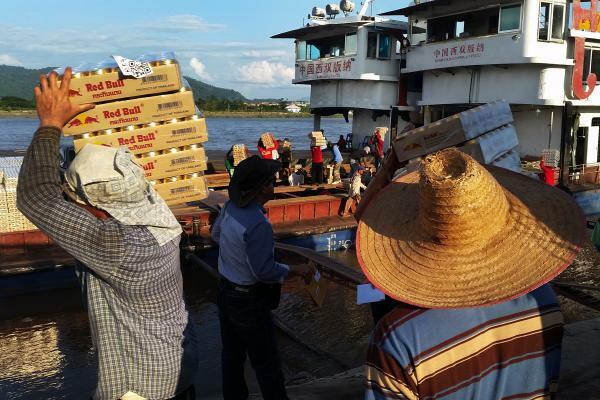 Day laborers outside Sob Ruak, Thailand, load energy drinks onto Chinese cargo boats on the Mekong for a trip upriver. About every month, a few Chinese gunboats cruise down the Mekong River through Myanmar and Laos from China's Guanlei port. They announce their arrival with a barrage of horns, then begin a long, sweeping turn back upriver just short of Thai waters, their propellers churning the mocha-brown water. Thai patrol boats sit bobbing gently, watching. As the Chinese border patrol boats leave, they let off one more long, loud burst of horns before heading back upriver, sometimes accompanied by a Lao gunboat. The Golden Triangle is known for being a drug-trafficking hub. The monthly patrols aim "to make the border river safer," according to China's Xinhua News Agency, after the killing of 13 Chinese sailors in 2011. But some analysts see a different interpretation: intimidation. The Chinese gunboat presence is "just to remind neighbors of the influence they can wield and that the hard power, the sharp power they hold is increasing, and I don't see that ebbing anytime soon," says Elliot Brennan, a research fellow at the Institute for Security and Development Policy based in Bangkok. China's economic and political influence is growing all over the world, particularly in Southeast Asia, its own backyard. China's Belt and Road Initiative is extending that influence, with the construction of roads, high-speed trains and ports in Southeast Asia well underway, which will give Chinese goods greater access to markets in the region and beyond. What's more, China is building a series of hydropower dams on the Mekong, which analysts say will produce needed electricity while posing major threats to the environment — and will further expand its control in the region. NPR recently reported along the Mekong River in Southeast Asian hot spots where China's expansion is already being felt and, in many cases, feared. "The control of both the South China Sea and the Mekong will strategically sandwich mainland Southeast Asia," Brennan says. "Beijing's control of Southeast Asian rivers is the other half of the so-called salami-slicing strategy in the region." He is referring to China's approach to gradually reclaim and build on reefs in contested waters of the South China Sea. The United States and its allies are pressing their claim to freedom of navigation in the disputed waters near China's newly constructed islands. But China has a natural advantage on the Mekong. The river starts on the Tibetan Plateau in China — in Tibet, it's called the Dzachu; in other parts of China, the Lancang Jiang — and runs nearly 3,000 miles through five Southeast Asian countries before emptying into the South China Sea. "Unlike the South China Sea, the Mekong space does not have really other major regional powers involved," says Thitinan Pongsudhirak of Bangkok's Chulalongkorn University. "So China does not have to contend with the United States like in the South China Sea or Australia or India and all the other countries." For over a decade, China has been building hydropower stations on its stretch of the Mekong River. Ten dams have gone up so far, with several more planned, according to the Stimson Center, a nonprofit think tank in Washington, D.C.
"This is a situation I feel can degenerate," says Thitinan, who has been studying the Mekong and China's growing influence along it. "If more dams are built and water is more scarce, then ... China can use its upstream position as a leverage and even as a coercive instrument," he says. Thitinan notes that roughly 60 million people downstream — in Thailand, Laos, Cambodia and Vietnam — depend on the river for most of their food and/or income. He says the dams are already affecting the region. Phongsee Sriattana, 52, runs a fishing tackle shop in the Thai village of Sob Ruak. She says the river's water levels and fish stocks have changed dramatically since China began building its dams. The closest one is in Jinghong, 180 miles upriver, in China's Yunnan province. "When I was younger, I would go to the river with my mother to catch fish," she says. "And there were so many they just jumped into our drip net. And I'd scoop them into my bucket." But that is not the case since the Chinese built dams upstream, she says. "When the Chinese want to send goods downstream, they release the water," she says. "When they don't need to sail their boats, they keep the water in their dams." She says the area used to have the famed and critically endangered Mekong giant catfish, but not anymore. "The water levels fluctuate too much," she says. "The fish can't lay their eggs here." Overfishing and downstream dams have contributed to the species' demise, biologists say. The Chinese dams also have an impact. They reduce water levels and the amount of nutrient-rich sediment needed for farming downstream. A few miles downriver, fisherman Singkha Wantanam, 61, sits in his tiny shack on the river's bank and frets. "I'm worried they will build more dams," he says, "but there's nothing to do to stop them. And then there will be even fewer fish." It's not just the dams that have people upset. China also plans to make parts of the Mekong wider and deeper to fit larger vessels and increase commerce along the river. Right now, 100-ton boats unload cargo at Chiang Saen Port about 15 miles downriver from Sob Ruak. China wants to use ships that can carry 500 tons of goods, all the way from Yunnan province down to Luang Prabang in Laos. That would mean blowing up rocks and dredging the rapids at a narrow part of the river. Environmentalists warn that would do even more damage to the Mekong and those who depend on it. "If they blast the rocks and rapids, it means they will destroy the ecosystem," says local environmental activist Niwat Roikaew. "When they destroy the ecosystem, it means they destroy food security for humans, for animals, for everything." Niwat wears a baseball cap that reads "The Mekong is Not for Sale." Standing on the Thai side of the river, he points to one of the narrow spots China wants to blast to make the river wider and deeper. When three Chinese survey vessels came last year to figure out how, Niwat led demonstrations against the plans. After months of protests, the Thai government put the project on hold. But political scientist Thitinan says that "it's a matter of time" for the plan to go ahead. "For Thailand, this is something that China ... has been demanding, and China has a pretty heavy price to exact if you don't go along. The pressure is going to keep coming," he says. He adds that "the pressure goes two ways," as there are Thai businesses want more trade with China, too. Several hundred miles downriver, Cambodia's capital Phnom Penh is undergoing a building frenzy largely fueled by Chinese money, public and private. And the port city of Sihanoukville farther south, many Cambodians say, is being transformed into an almost completely Chinese city. Kim Heang, the CEO of Khmer Real Estate Co. in Phnom Penh, says the Chinese "feel safe to invest in Cambodia." "When Chinese come here, they have protection" he says. "Nobody can do something wrong to Chinese investors because they have support of Chinese government." When asked whether Cambodians benefit too, he answers "yes and no." "The people who come to invest will get the benefit, of course," he says. Rich Cambodians who sell them property will, too. But while some ordinary locals can get service jobs related to the investments, he explains, it isn't the kind of work that lets them provide their family with a good future. As for the majority of Cambodians, he adds, "They are not happy." One certain Cambodian beneficiary is clear: Prime Minister Hun Sen. China's backing has helped embolden him to eviscerate the Cambodian political opposition, crack down on independent media, intimidate civil society groups and extend his 33-year-long rule. When the United States and the European Union withdrew funding for Cambodia's election held in July, China stepped in to provide $20 million for voting equipment. All that made it easier for Hun Sen and his ruling party to sweep the vote, widely condemned as a "fraud" by human rights groups and foreign governments. But the government's reliance on China's largesse, critics say, leaves Cambodia at risk. "At this stage, the fact that Cambodia has been shifting away from the West makes Cambodia almost completely relying on China for backing — domestically, internationally and economically," says Virak Ou, head of the Phnom Penh think tank Future Forum. "Which means we are beholden to China." Among China's series of infrastructure bids for Cambodia, one project stands out: a megadam planned for the town of Sambor, about a six-hour car ride upriver from Phnom Penh. If built, it would be the largest mainstream dam on the lower Mekong. But researchers and local residents fear it could do major damage. 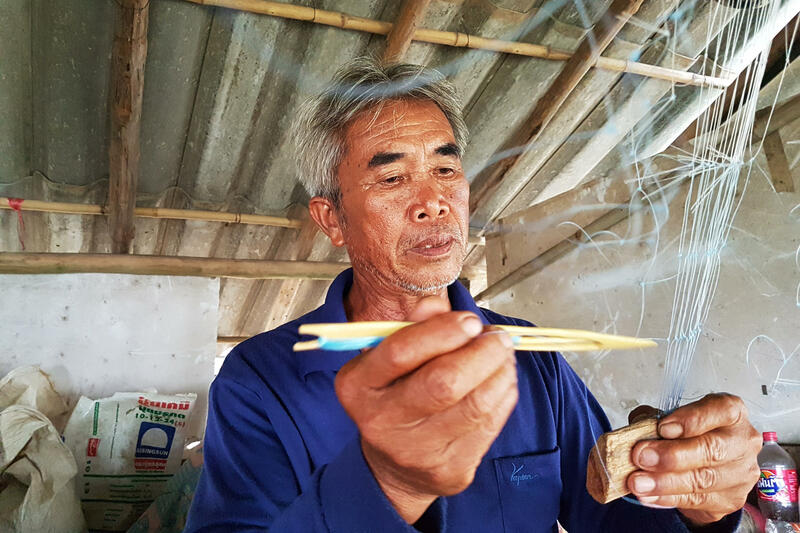 "We don't want to see a dam happen here," says 47-year-old Seng Chanti, who has lived on the island of Koh Pdao, in the middle of the river, almost his entire life. He's a fisherman but splits his time showing tourists the rare — and endangered — Irrawaddy dolphins that survive in this part of the river. "If the dam happens, for sure, there will be no more dolphins and no more fish in the area," Seng says. "The location of Sambor means that if the full 2,600-megawatt project were to be built out, it would essentially destroy the fisheries in Cambodia," says Courtney Weatherby, a researcher at the Stimson Center's Southeast Asia program. The California-based Natural Heritage Institute produced a highly critical study of the Sambor dam project, commissioned by the Cambodian government. The Sambor dam could "literally kill the river" by devastating fish stocks and causing other environmental wreckage, the report's executive summary said. Cambodia imports most of its energy. It needs cheaper electricity than what it buys from its neighbors. That means Prime Minister Hun Sen may not heed the report's warnings, which makes some residents worried. "If there's no more fishing and no more ecotourism, how will we live?" says 53-year-old Phum Saoin, another fisherman who helps run ecotourism tours around Sambor. Sure, there will be electricity, he says, "but we cannot eat electricity." Chinese firms have helped finance more than half a dozen other hydropower projects on Mekong tributaries in Cambodia and neighboring Laos, including Cambodia's controversial 400-megawatt Sesan 2 dam that went online last year. The dams already built on the mainstream Mekong in China proper have, by some estimates, reduced sediment loads downriver by more than 50 percent. With more dams planned, water levels and sediment load could drop even further. There is also a doomsday scenario for China's downstream neighbors. "Long term, China, being one of the countries with the least amount of water allocation per capita in the world, is going to need water," says Brian Eyler, the Stimson Center's Southeast Asia project director. "If political directives change, then perhaps engineers are going to look at ways to get that water from Mekong dams into China proper. And then we're looking at a big problem, particularly in the dry season, when the water of the upper Mekong is all the Mekong downstream has," he says. Without that water, the world's largest inland fishery, which produces as much as a quarter of global freshwater catch, would be in danger. The livelihoods of tens of millions of people living in the lower Mekong would be as well, because of the loss of water, fish and sediment that helps produce the fertile soil and abundant crop — especially rice — they depend on. For them, China's influence isn't a hypothetical. It's something they're feeling more every day along with the effects of climate change and habitat loss. China is aggressively looking outward. It's investing heavily in Africa, South America, Australia and in its own hemispheric backyard, Southeast Asia. China's Belt and Road Initiative looks to link China to the world through high-speed rail and roads and South Asia's major river, the Mekong. Here's Michael Sullivan as part of our continuing coverage on China's growing role around the world. MICHAEL SULLIVAN, BYLINE: The Chinese tourists are here already in Sob Ruak, the tiny tourist town on the Mekong River where Laos, Myanmar and Thailand meet. VOICE RECORDING: Happy Buddha (laughter). SULLIVAN: And it's not just tourists. Pretty much every month for the past few years, a trio of Chinese gunboats arrives here from the Chinese port of Guanlei, 160 miles upriver. SULLIVAN: The gunboats are careful to turn around just short of Thai waters, where Thai patrol boats bob gently. But the Chinese border patrol force boats don't leave quietly. SULLIVAN: China's Xinhua news agency says the joint patrols - sometimes there's a Lao boat, too - are aimed at making the river safe. ELLIOT BRENNAN: This kind of pressure will be increasing over the coming years, quite simply - those sort of tactics by China just to remind neighbors that influence that they can wield and the hard power, the sharp power that they do hold is increasing. And I don't see that ebbing anytime soon. SULLIVAN: Elliot Brennan's recent analysis in the Lowy Interpreter is titled "China Eyes Its Next Prize - The Mekong." BRENNAN: The control of both the South China Sea and the Mekong will strategically sandwich mainland Southeast Asia. Ultimately, Beijing's control of Southeast Asian rivers is the other half of the so-called salami slicing strategy in the region. SULLIVAN: China has a natural advantage on the Mekong. The river starts on the Tibetan Plateau in China before continuing its nearly 3,000-mile-long journey through five Southeast Asian countries before emptying into the South China Sea, all of them with a history of Chinese political or economic influence. THITINAN PONGSUDHIRAK: Unlike the South China Sea, the Mekong space does not have really other major powers involved. So China does not have to contend with the United States like in the South China Sea. But in the Mekong space, China is on its own really. SULLIVAN: And that concerns Thitinan Pongsudhirak of Bangkok's Chulalongkorn University, who worries about the effects of China's dams on downstream countries in the lower Mekong, where some 60 million people depend on the river for their livelihoods. PONGSUDHIRAK: This is a situation, I think it can degenerate. If more dams are built and water is more scarce, then it becomes a zero sum. And China can use its upstream position as a strategic leverage and also maybe even as a coercive instrument. SULLIVAN: Fifty-two-year-old Phongsee Sriattana (ph) runs a tackle shop on the Mekong in Sob Ruak on the Thai side of the river. SULLIVAN: "When I was younger," she says, "I would go to the river with my mother to catch fish. And there were so many, they'd just jump into our drip net. And I'd scooped them into my bucket," she says. "Not anymore." SULLIVAN: "When the Chinese want to send goods downstream, they release the water from their dams," she says. "We used to have giant catfish here before that could reach several hundred pounds in weight." "But after the dam," she says, "the water level fluctuates too much, and the fish can't lay their eggs here anymore." SULLIVAN: And China's not done. Ten miles downriver, at the Thai port of Chiang Saen, laborers load boxes of mushrooms and secondhand luxury cars onto a Chinese boat. China wants even bigger boats to carry bigger loads. And to make that possible, it wants to blow up rocks in the river south of here to make it wider and deeper and allow boats to go from China's Yunnan province all the way down to Luang Prabang in Laos. I meet activist Niwat Roikaew on the Thai side of the river south of Chiang Saen. He's a retired teacher with an encyclopedic knowledge of the river. NIWAT ROIKAEW: (Through interpreter) If they blast the rocks and rapids, it means they will destroy the ecosystem. And that means they destroy food security for humans, for plants, for animals and for everything. SULLIVAN: When China sent surveying vessels here last year, Niwat and others protested. They've already done enough damage, he says. After months of protests, the Thai government put the project on hold. Thitinan Pongsudhirak of Bangkok's Chulalongkorn University thinks that's only temporary. PONGSUDHIRAK: For Thailand, it's something that China will demand, has been demanding. And China has a pretty heavy price to exact if you don't go along. So I think it's a matter of time. SULLIVAN: China exerts its influence downstream in many ways. Money works, too, as China funds dams on the Mekong and its tributaries in Cambodia and Laos. SULLIVAN: I'm sitting in a fishing boat on the Mekong in the Cambodian district of Sambor, about five hours north of the capital Phnom Penh. And this is where the government is planning a new mega-dam, despite a study the government commissioned but hasn't released that calls the site the worst possible place for one and warns it could literally kill the river. But Cambodia needs electricity badly and may not heed the report's warnings. Residents on Koh Pdao island, in the middle of the river, are worried about the fish and the endangered Irrawaddy dolphins that bring tourists here - and their cash. Forty-seven-year-old Seng Chanti is one of the fishermen. SENG CHANTI: (Through interpreter) If the dam happens, for sure no more dolphins, no more fish in this area. SULLIVAN: But you'll have electricity, I say. SENG: (Through interpreter) I cannot eat electricity. If there's no fish, no dolphin, how will we survive? SULLIVAN: The Cambodian government seems intent on pursuing construction of the dam, and the Chinese government seems happy to throw money at Cambodia in exchange for political fealty. Virak Ou heads the Phnom Penh think tank Future Forum. VIRAK OU: At this stage, the fact that Cambodia has been shifting away from the West makes Cambodia almost completely relying on China for backing. That means that we are beholden to China. SULLIVAN: The tighter China pulls the downstream countries into its orbit, critics say, the greater the danger to the river. And some analysts say it could get even worse - two words, water scarcity. BRIAN EYLER: Long term, China, being one of the countries with the least amount of water allocation per capita in the world, is going to need water. SULLIVAN: And then, says Brian Eyler, who heads the Stimson Center's Southeast Asia program, China could decide to repurpose its dams. EYLER: As long as those dams are purpose for hydropower, the water will flow down into Southeast Asia. But if political directives change, if resource allocation needs change, then perhaps engineers are going to look at ways to get that water from Mekong dams into China proper. SULLIVAN: And that would be a problem for the countries downriver, who depend on that water for the fish they eat and the sediment that helps produce the fertile soil downstream, especially in Vietnam's Mekong Delta, some 60 million people who could have to find other ways to feed themselves. For NPR News, I'm Michael Sullivan on the Mekong. Transcript provided by NPR, Copyright NPR.